Ever since I first saw Waitress back in early 2008, I have loved it more than words can say. I don't know why I haven't watched this movie in nearly two years, but seeing it again just reminded me of the genius of Adrienne Shelly. And how much this town needs a pie shop and a pie maker like Jenna. 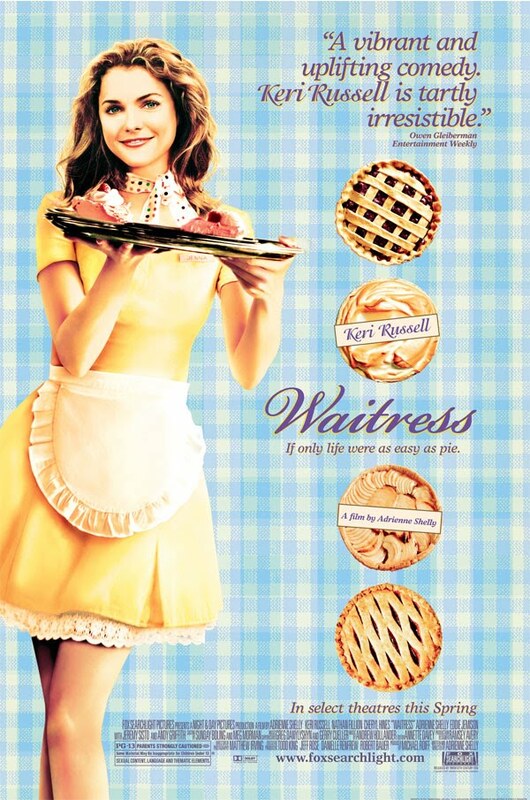 Jenna Hunterson (Keri Russell) is a woman who just wants to make pies and get away from her evil and aggressive husband Earl (Jeremy Sisto). But her plan is put in jeopardy when she discovers she is pregnant. She really doesn't want the baby, and goes through the pregnancy, still hoping to leave her husband and win a pie contest. Things change again when she meets a new doctor, Dr. Pomatter (Nathan Fillion), who she starts an affair with. This probably could have been just another pregnancy romantic comedy, but it wasn't. What was different about this movie is that it has heart. Most women could probably relate to it on so many different levels. Keri Russell is adorable as Jenna, showing some real depth into her unhappy character. However, I'm probably not the only one who absolutely hated Earl. Jeremy Sisto packs so much aggresiveness into the role that he is impossible to like in any way shape or form. Adrienne Shelly created a masterpiece of true Independent comedy spirit with Waitress. Sure, it may not have been a huge money spinner or got a big release, but the film is too human to even have a place among huge blockbuster comedies and the like. What is a shame though is that this film and Juno were both released by 20th Century Fox, but Juno got pushed into the spotlight because of Ellen Page's performance. Waitress deserved to be nominated for a few Oscars, especially Best Actress for Keri Russell. If they also had a yummiest film category, this film would definitely win. Waitress is an amazing and delightful comedy by Adrienne Shelly, who showed pure writing and directorial talent with this film.